The humor of Archbishop Joseph W. Tobin will shine soon when he recalls his days as a hockey player and a keyboard player in rock n’ roll bands. Yet right now, the newly appointed archbishop of the archdiocese is in a thoughtful mood as he shares two of the love stories that have defined his life and will shape his leadership of the nearly 228,000 Catholics in central and southern Indiana. The first one involves the love of his parents—Joseph and Marie—for each other. “As years go on, I become much more aware and much more grateful for the gift of one’s family, beginning with my parents,” the oldest of their 13 children says with reverence. “My mother had five cousins and three aunts who were nuns. She was the first woman in several generations to marry. “My dad’s mother immigrated to Boston and came from a rather poor, passionate and rollicking group of shanty Irish. His second love story reveals the depth of the bond between a father and a son. Growing up in a family that lived in one half of a duplex in Detroit for all of his childhood and youth, Archbishop Tobin saw up-close the way his father treated his mother and cared for his children. At 19, the future archbishop and his father worked alongside each other as they helped to build a larger house for the family on a small farm in Canada. “I think the greatest gift my father gave me was an image of manhood,” the archbishop says. “A man in the best sense. A chivalry toward women. A self-sacrificing love for his family. Of course, the reality of nearly every love story is that there are not only chapters of hope, but heartbreak, too. 60-year-old archbishop recalls. “So I know what it is a bit to be in a troubled family, a family that has to struggle against odds. Those qualities of faith, family, hope, humility and hard work have guided Archbishop Tobin in his nearly 35 years of serving God and the Church as a priest. So has a sense of humor. He believes a sense of humor is an essential part of the spiritual life. Being of Irish descent, he says, he is also part of a people who have always had a capacity for laughing at themselves. Archbishop Tobin shows that tendency when he recalls his youthful days as a keyboard player in less-than-stellar rock n’ roll bands. He notes that people’s favorable impressions of his bands improved with the number of drinks they had enjoyed. “We used to play in some real dives,” he says, smiling. His easy smile bursts into a full laugh when the conversation turns to his passion for playing ice hockey. He recalls the time an opponent whacked him in the mouth, leaving a cut that led to 40 stitches and a bruised, puffed-up lower lip, just days before he was ordained a transitional deacon. “I remember kneeling in front of this auxiliary bishop, and he was staring at me because of my stitches,” he says with a laugh. While a sense of humor is at the core of Archbishop Tobin, even more so is the deep sense of the connection between faith and humanity. 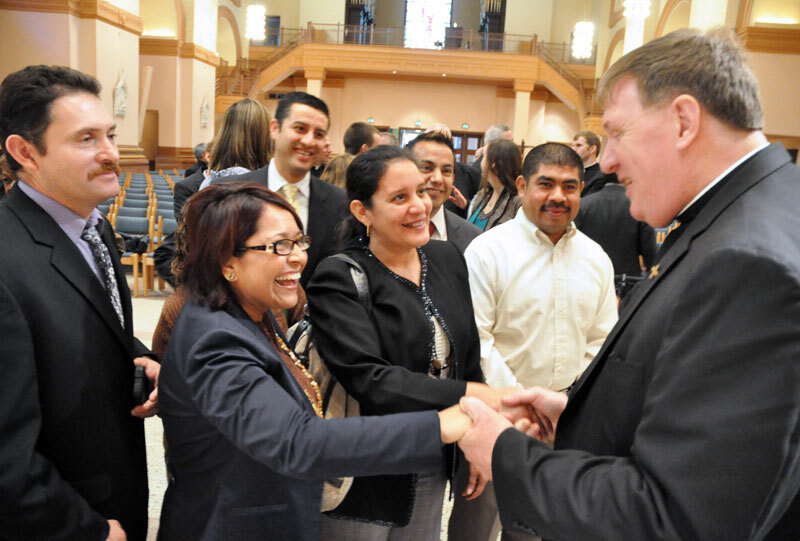 As pastor of his home parish in Detroit and later at another parish in Chicago—both with large Hispanic communities—Archbishop Tobin embraced the ‘catholic’ nature of the Church, seeing strength in diversity. That appreciation grew as he traveled extensively around the world in his past two roles for the Church. From 1997 to 2009, he served as superior general of the Redemptorist congregation. In 2010, Pope Benedict XVI appointed him as secretary of the Congregation for Institutes of Consecrated Life and Societies of Apostolic Life. It’s the second highest-ranking position overseeing the more than 1 million men and women in the world’s religious orders. This appointment also led to him being ordained a bishop in the same year. Along the way, the fan of the University of Notre Dame football team also became fluent in five languages—English, Spanish, French, Italian and Portuguese. After delivering that touch of humor, Archbishop Tobin smiles again, believing those languages and his experiences will serve him well in leading an archdiocese that is increasingly becoming more multicultural. His tendency is to reach out, to share, to make room, to be inclusive—lessons that once again hark back to growing up as one of 13 children in one half of a duplex. His love for his sisters and his mother—as well as being educated by Immaculate Heart of Mary sisters and working with them in parish life—undoubtedly shapes his conciliatory and appreciative attitude toward women religious in the midst of a Vatican appointed visitation of women’s religious communities in the United States in recent years. He is equally supportive of Catholic education. He knows the impact that Catholic schools have had on his life and on generations of Catholics. That combination of quiet strength, purpose and commitment shines through moments later when he answers a question about his interest in the study of secular culture and its impact on faith as it relates especially to teenagers and young adults. It’s a reality he has found in his own life. It’s a faith he wants others to know and share. It’s a faith that has defined his priesthood for nearly 35 years. “The experience is one of gratitude for everything,” he says. “It’s like that phrase at the end of Diary of a Country Priest where the dying priest says, ‘But all is grace.’ So even what I think are the disasters, the great failures of my life, they were moments of grace because the Psalms say God is close to the brokenhearted.